Clevinger and Wegener bring a great deal of fun to “Atomic Robo”. “Atomic Robo and the Fightin’ Scientists of Tesladyne” is hell-bent on making sure readers have a good time as the book traipses around the planet (and beyond) willy-nilly, and back and forth across the decades. The book is a spirited adventure-romp and the characters who reside in its off-beat world are a colorful cast of adventurers, led by the endlessly amusing Atomic Robo. Written by Brian Clevinger and drawn by Scott Wegener, “Atomic Robo” is the story of a robot soldier who is granted U.S. citizenship for stepping in to thwart some Nazi evil-doing of the most vile nature. In fact, the details are not completely clear, Robo is sent to Asia to stop Baron Heinrich Von Helsingard from completing his transformation into a mystical superman. Once their initial battle is over, rather quickly, an antagonistic conflict is born as the two immortals find themselves at odds time and again. Amidst this acrimonious relationship are battles with giant ants, mummies, and mobile pyramids. Things settle down enough for Atomic Robo to take a fairly peaceful trip to Mars. While not all of the villainy is tied to Helsingard, Clevinger continues to come back to him to keep us reminded of his tyrannical reign. Of course the whole book remains tongue-in-cheek, but the action is the fun-filled over-the-top fare that we don’t get enough of in comics and is usually reserved for the best Steven Spielberg films. The secret weapon of “Atomic Robo” is Wegener’s fantastic artwork. First off, the design for Atomic Robo is exceptional. His body is thick and simple, his appendages fit together like an action-figure, and his expressive eyes take up two-thirds of his helmet-like face. As a bonus at the end of the trade, Clevinger discusses the Atomic Robo concept art from beginning to end. The action set pieces that transpire in “Atomic Robo” are dizzying in number and they transpire every few pages as we take momentary breathers to advance the story. Wegener’s is excellent at conveying movement. Lots of it. Characters jump from planes, robots smash through walls, marauding mummies… maraud, and so on and so forth. It’s not just about drawing consistent characters for Wegener, he is also tasked with positioning the panel just right and choreographing a scene well enough so as to suitably express the action that is taking place. And he does his job well. Wegener’s character work is cartoonish and madly expressive. The artist’s line work is clean and he keeps his panels clear and uncluttered from unnecessary details. The story slows down for a bit as we travel back to the mid-Seventies where Robo is working with Carl Sagan to accompany the Viking lander to Mars. The interlude takes place while Robo is knocked out during a separate scene and it is played mostly for laughs as we learn that the robot has found another adversary along the way: Stephen Hawking. While we don’t know what the source of the ill will is between these two, we are witness to the hilarious and limitless disdain they share for one another. The fact that it is never explained makes it more hilarious. 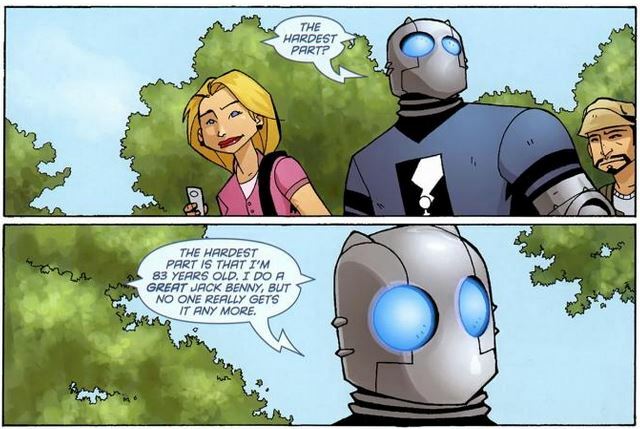 “Atomic Robo” has a surprising amount of heart. Soldier 2: Yes actually. I see a huge waste of time. Soldier 1: I see an excuse to smoke. Want one? Soldier 2: No, my face goes numb without the scarf. This innocuous back and forth isn’t revelatory and it doesn’t push anything forward in terms of the story, but it establishes that there are a couple of real men on the side of that mountain, not just soldiers. It adds depth to the piece. Too often writers miss careful details such as this, or worse, they don’t understand that a small bit of dialogue can be used to create scene that rings true to the reader. The one gripe about this opening volume of “Atomic Robo” is that we never get a feel for who Helsingard is and what makes him evil. We see that he’s a Nazi. We see that he’s eager to take over the world with his newfound powers. We see that he continues to show up to do battle with Atomic Robo. But what makes Helsingard evil? Clevinger doesn’t give the villain anything particularly nasty to do, so as readers we are just go with the fact he’s a bad guy and that is that. On the other hand, Clevinger does mine for the humanity in Atomic Robo. One of the best sequences is when he writes a letter to a woman whose grandfather served with Robo in the war. The scene isn’t the slightest bit maudlin. Robo writes a letter to the woman that captures the more fun-loving spirit of her grandfather before acknowledging that the man was a capable soldier. The brief scene that follows illustrates that there are consequences to immortality; the exploration of this may be left for future volumes because it isn’t readdressed here. “Atomic Robo” concludes with four “B” stories, four and five page backups, featuring stories by Clevinger and art by Joshua Ross, Zack Finfrock, Christian Ward and Nic Klein. The stories vary in quality but the only standout was a one featuring art by Christian Ward (“The Infinite Vacation”), who is also credited with the story. I got the strong sense that this was produced in the Marvel Style because of the self-referential dialogue Clevinger uses, which feels as though it was written after the scribe saw the artwork. As Robo stands atop a pile of beasts, he’s trapped in mental battle with a villain, he strikes a triumphant Conan-style pose with his sword and utters the line, “I never get to pose like this in real life.” Ward’s psychotropic imagery is so far removed from Wegener’s artwork, but it is always exciting and compliments the story that Ward and Clevinger are telling. “Atomic Robo and the Fightin’ Scientists of Tesladyne” is fun action romp across time that slows down very little and never takes itself too seriously. This is one of those books that’s destined to show some wear because of the frequency in which you’ll grab it from your bookshelf for a good laugh.